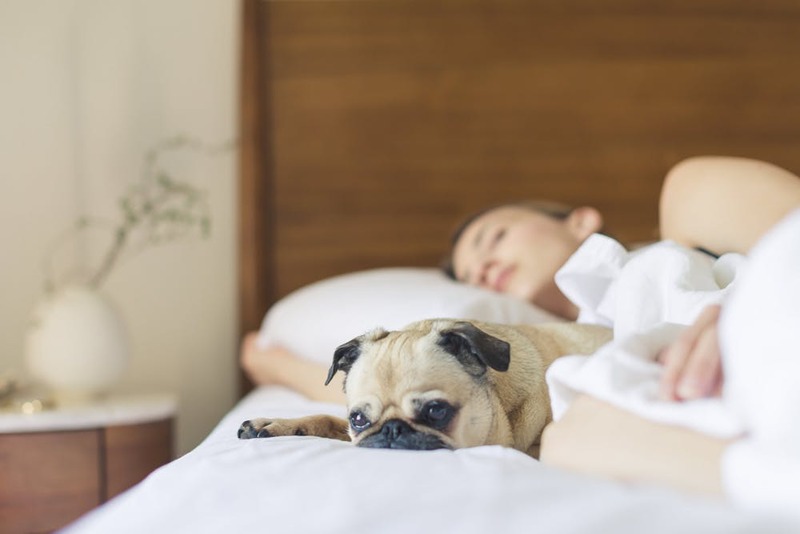 Sleep may seem like a bit of a waste of time because as you snooze you could be answering e-mails, doing work or swiping right, but if you don’t get enough rest, you won’t do any of these things very well. Sleep not only refreshes you and let’s your body, brain and skin recover from the day, it can also help ease depression and anxiety, decrease the illness, help with your memory, improve your immune system, prevent weight gain and make you happier and more productive. If you want to get more sleep, and better sleep, we have some ideas that might help. Regular exercise that’s part of your daily life really can help you to sleep. As well as reducing stress and relieving anxiety, exercise, whether it be cardio, strength training or yoga can improve your general wellbeing, boost your mood and help your body to wind down at the end of the day so you can sleep. We wouldn’t suggest a HIT workout at 9pm, but you might find that some gentle stretches in the evening, combined with meditation, will ease tension and get you feeling more rested. Many of us drink caffeinated drinks as a way of staying awake and alert during the day, but the downside is that this can actually keep you awake at night. Try to stop drinking caffeine heavy coffee, tea and fizzy drinks six to eight hours before bed, sipping on water and herbal teas instead, and you will be glad you did. You might find that making a list of things to do the next day will stop things going around in your head when you do get into bed. Another way to end your day is to list three things you have been grateful for and this means you will see just what you have accomplished and how well you are doing in life which means there is no need to lie awake worrying. Having a warm bath, meditating or listening to a calming app while lying in bed are all gentle ways to get you in the mood for sleep. If you can turn off your daytime worries and switch into a more relaxed mode, it will help you to get ready for sleep. You might not think it but your body craves consistency, plus you’re more likely to get enough sleep if you schedule it in the same way you do with other important tasks in your life. Set a time when you turn off screens, have slot for taking a bath or shower and set your alarm for the next day, and if you can, get up at the same time everyday so you keep things in a pattern, even better. Bed is not a place for paying bills, writing reports or watching scary movies, it is a place for peace, quiet and sleep. Have clean bedding, comfortable pillows, a decent mattress, make sure the temperature works for you, get soft lighting and black out blinds and make your bedroom a place you want to be in. If you don’t fall asleep after 15 minutes, why not get up until you feel ready to drift off? Don’t turn on your phone or start answering emails, instead have a warm drink, read a book, do some yoga or meditation and try to set your mind free. If you’re still having trouble sleeping, why not speak with your doctor and see if they can help you get back on track. If you received a broken heart for Christmas, we really feel your pain because we know only too well that dealing with a break up can be really tough. Whether you are feeling sad, angry, betrayed or confused, don’t worry, these are all natural responses when a relationship ends, and while we know there is no quick fix, we do have some ideas to help you get back on track again. Social media makes it possible to hold onto your ex for longer than you may have done in the past, so we suggest you delete them for once and for all. Yes, you might want to see what they are up to, but the more you check Facebook and Instagram, the harder it is going to be to let go, so delete them right now. Blocking might feel harsh, but it has to be better than agonising who that girl is in the photo and if you are still feeling upset several months down the line and they change their relationship status, you don’t want to know. So go on, do it now and ask other people not to tell you what is happening with you ex too! Everybody hurts sometimes, so after a break up spend some time alone and have a good cry, get those feelings out there and yes, feel sorry for yourself, it’s allowed. Whether you were the one to make the break, or the one who was dumped, you need time to get over the end of a relationship. You have been on holiday together, maybe shared a home, have the same friends and then there’s ‘your song’ and none of those things are going to be erased in a few days. Time is a healer, so give yourself that space and over the coming weeks and months, things will get easier and you will start to see the sunshine again. Yes, you will want to be alone to heal your pain, but you don’t want to become a recluse. Spending time talking to the friends and family you love and who make you smile, is so important and will help you feel connected and supported. Whether you talk about your break up, the reasons why or what to do next, chatting with people you trust not only gives you another point of view, but it can be a distraction from your thoughts which can be a huge help. Try not to bottle things up as that can make things worse and if you get to the point when you just can’t see the wood for the trees, maybe speak to your GP. Yes, watch those sad films and get into bed with your hot water bottle and onesie, but it is also important to get up and move about. Having those feel good endorphins pumping around your body can be a great way to heal and help you to move forward. Going for a run, taking a dance class or jumping on your bike can all help deal with your stress levels, boost your mood and you will be distracted from your heartache. After a breakup you might not want to do anything nice for yourself but it is one way to reboot, and you have to love yourself before you can love anyone else again. Now is the time to treat yourself to something that will make you feel good, and whether it is a facial, coffee with friends or a trip to the cinema, doing this is key to healing and will help you to smile again. Remember – you’re worth it! While we have given you some ideas of how to feel better, there is no timescale for this. You are human and will deal with your emotions in your own time and own way. Mending a broken heart is a marathon, not a sprint, so don’t compare yourself to anyone else, go at your own pace and as you are kinder to yourself, you will start to feel happy again.